It’s been mentioned before that 75 percent of global consumers prefer to buy products in their native language, and that 60 percent rarely or never buy from English-only websites. Achieving global fluency goes beyond language to include separate images, CSS, color schemes, and branding, with some brands even opting for market-specific logos to go global by going local. For the translators or language service providers who furnish this level of detail and personalization across multiple language sites and markets, it’s easy for things to descend into confusion. This is largely due to the fact that individual strings of text lack context, and without context your translators, project managers, and any additional project stakeholders or collaborators, are fumbling around in the dark. Translation management software that offers in-context translation and review helps to avoid translations exceeding the available space, just one of countless reasons for the constant back-and-forth between translators and project managers in traditional translation and localization models. Isn’t it better to give as much back-end visibility into the personalized brand experiences you offer to those responsible for delivering them? As translations are added for each string, they replace the original text in the context window, allowing translation resources to see what their content will look like on the published website. 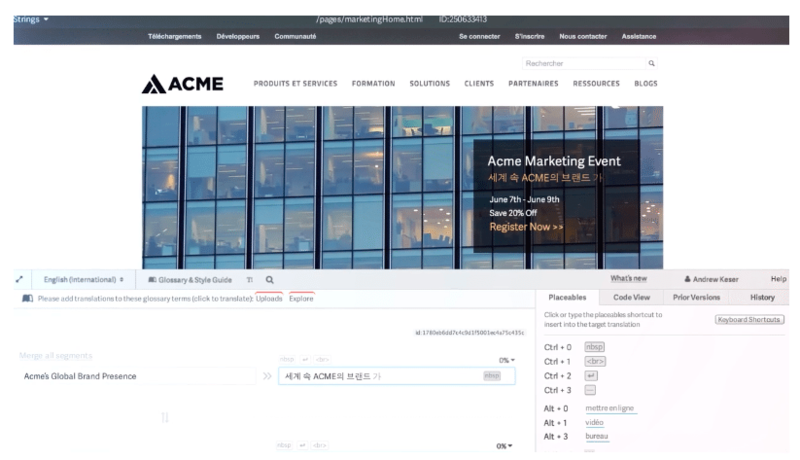 Smartling’s Translation Management Platform features a robust translation memory, global brand manager, vendor manager, translator workbench, and analytics engine, wrapped in an enterprise security framework. But when it comes to the day-to-day tasks of translating, localizing and publishing quality content for your multilingual audience, perhaps in-context translation and review is the most appreciated feature. Download the full Product Brief – In-Context Translation and Review, or visit Smartling’s Resources Page to access case studies, white papers, ebooks, videos, and product briefs.